Since Apple launched its In App Purchase functionality it has been supporting two types of virtual goods: Consumables and Non Consumables. The main difference between these two is their durability. 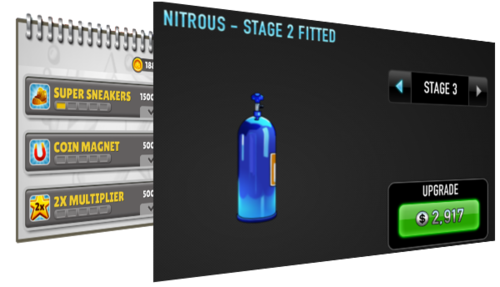 With consumable items the developer expects the user to consume the goods over time and possibly replenish the supply. Tokens, Coins and points are usually consumable goods. Non Consumables on the other hand are expected to last forever and so this type of goods can be used to implement extra levels, remove ads feature or upgrading to a premium version of the game. One might note that this definition only applies to virtual goods that are sold as a cash transaction through the Apple In App Purchasing functionality. The Consumable items allow more flexibility to developers who can use them to design many types of virtual goods with different consumption models including ones that last forever. The Google Play terminology of Managed Items (equivalent to Apple’s Non Consumables) and Unmanaged ones (equivalent to Consumables is more respective of the fact that developers can manage the consumption of their virtual goods based on different models. Using In-App Purchase in mobile games requires more types of virtual goods then what is provided by the App Store and many game designers find that there are at least four additional types: Single Use, Lifetime Use, Equip-able Items and Item Upgrades. Virtual items that the player can only use once before he has to purchase more are often called Single Use goods. These goods can normally be accumulated and so the user has a balance of them. This type of goods is very similar to the original meaning of Consumable items but since Consumable has a wider definition we need to redefine these goods as Single Use. Another difference is that that a developer can limit the accumulation of Single Use items. For example, you can only carry 8 bullets in a cartridge. Good examples of Single use items are: shots, fuel and fish food. These are virtual goods that are available for the player for as long as he plays the game. They are somewhat similar to Non-Consumable products with one big difference – they are not purchased directly as an In-App Purchase but with virtual coins. From this reason, the developer can’t relay on Apple’s Non Consumable type and has to design it’s own way of preserving the goods for the user. Race tracks, Game Upgrades and Buildings are good examples of Lifetime use Goods. Equip-able items are a sub category of Lifetime Use items. The main difference here is that the user has to choose a virtual good before he enters the game play mode. Cars and Characters are usually implemented as equip-able items. Unlike upgrades to the game itself that are normally defined as Non-Consumables (Remove ads) or Lifetime Use (Double Coins) these items upgrade some attribute of another Virtual good. There is usually a strong bind between the original virtual good and it’s upgrades so that an upgrade is only applicable to a specific virtual good. In some games a Tire can be an upgrade for a Car while in others, Coin magnet level 2 will be an upgrade for the basic Coin magnet. Item Upgrades are normally implemented as Lifetime products. Previous articleApple Settles Parents Claim – Who Wins?